Trim came out on top in this division 2 A league match, played in sweltering conditions in Kilskyre on Sunday afternoon. The visitors got off to a perfect start when Paul Gilsenan split the posts in the opening minutes. However, the lead lasted barely sixty seconds, as Ronan McGuinness finished off a great move instigated by a blistering run from Benji Smith. Gilsenan continued his impressive display in midfield for Trim with a further two points in the opening ten minutes. 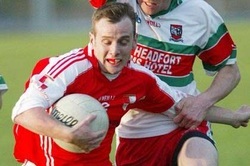 A well taken point from Kevin Devine managed to reduce the deficit before Trim hit a dominant patch in which they managed to increase their lead to eight points. Trim’s imposing full forward Martin McNally raised the first green flag of the contest, finishing powerfully into the net, after impressively fielding a speculative high ball into the Ballinlough area. Less than five minutes later McNally had picked up his second goal of the day, converting at the second attempt, after a brilliant reaction save from the unlucky Keith McGuinness in the Ballinlough goal. It appeared as though the contest was turning into a one sided affair, with the home side trailing 2-04 to 0-02, but the ‘Lough finally found their footing and hit six unanswered points, beginning with a well taken score from the impressive Emmet Smith. Colm Mallen was also rewarded for his hard working display with three points before the break. James Baugh, the young half back, continued to show great attacking potential, with a classy score towards the end of the half. The momentum seemed to have shifted back in Ballinlough’s favour as the home side went in trailing by just one point, 2-04 to 0-09, at the change of ends. However, the second half got off to the worst possible start for the ‘Lough as they conceded a penalty almost immediately. This was coolly dispatched by James Toher, who had just been introduced as a half time substitute. The teams exchanged further points, as the match became a much cagier affair. Ballinlough needed something special and it came in the fifteenth minute of the period. Corner back Benji Smith produced a mesmerising run from his own half, evading several tackles along the way, to rifle home a spectacular goal and drag the Reds back into contention. Trim remained solid though, and further scores from Gilsenan and Keith Hamilton saw them edge further ahead. Kevin Devine and Niall Farrelly tagged on late scores for the ‘Lough, but it was not enough to avoid another defeat, as Trim ran out two point winners. Best for Ballinlough on the day were Benji Smith, Emmett Smith and Ronan McGuinness. Ballinlough: K. McGuinness, B. Smith, P. Muldoon, R. Farrell, J. Baugh, M. McCullen, E. Smith, T. McCullen, K. Mallen, C. Mallen, R. McGuinness, K. Beirne, J. O’Higgins, K. Devine, N. Farrelly. Subs: O. Brady for O’Higgins, D. Lynch for Baugh.